What are you neglecting when you search a commercial or government database of California professional licenses? 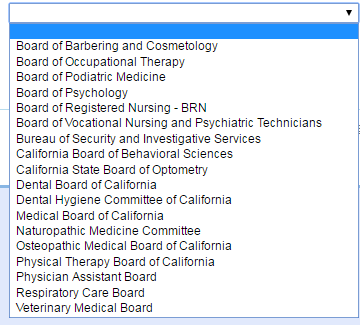 The California Department of Consumer Affairs license lookup enables simultaneous search of a handful of disciplines. It’s limited and you can’t tell which licensing agencies aren’t included. Among the security guard and nurse licenses are odd certifications, too. There are dozens of occupations that require a license or certification to practice. Just a few that are not in the Breeze aggregated government database and have to be searched separately: Contractors State License Board, Emergency Medical Services Personnel Registry (EMT and Paramedic), California Department of Public Health (CDPH) Laboratory Personnel License Search — distinct from the same agency’s medical personnel database and also the CDPH Radiologic Health Branch database. Not sure why a single agency can’t combine all the licensees in one database or release them as a dataset, as with the X-ray Technologist Listing. You get the idea. It’s messy. Your massage therapist or public school teacher have their own license lookups. But you knew that. I think the CSLB license is the only one I’ve cited that’s in a commercial database. Otherwise, you have to go to the government website or call the agency to verify a license. A database provider relied on by many investigators provides this caveat. Due to the large volume of types of professional licenses created by the inconsistency of titles between states, a complete listing of all professional license types is not available. This entry was posted in California, Databases, Public Records. Bookmark the permalink.